The 11th of June 2006 changed British military history but for those that were there it was just about doing the job and taking care of their own. Growing up in the midlands Pte Norris wanted to be a soldier. She applied to join Artillery but narrowly missed passing her fitness exam. A year of college later she aced the fitness exam but chose the Royal Army Medical Corps. 9 months of training followed before being posted to Germany where she put her hand up to go to Iraq. She was attached to the 1st Battalion Princess of Wales Regiment, the only woman amongst 300 men. There she met Colour Sgt Ian Page who was having his birthday shortly after she got there. ” When he told me how old he was, I told him he was old enough to be my father, and he said don’t be cheeky, but after that, I always called him dad and he always called me daughter,” Pte Morris explains. During a night operation in Al-Amarah with Warrior vehicles the British forces were attacked. ” I heard a big bang up front and the driver said the commander [Page] had been hit. I asked if he was okay and nobody spoke. I told the other guys to let me out. I managed to climb up the outside of the vehicle and down through the turret. ” Pte Morris recalls. While she climbed up the side of the Warrior she was fired upon by snipers. One bullet hit her rucksack. ” I suppose I knew there were bullets, but I didn’t know how many and you don’t think, I need to be brave, you think, “I just need to get to him.‟.” explains Morris of her courage under fire. She found Sgt Page who had been shot in the mouth, looking steadily upwards at her, trying to tell her what to do, staying calm as the shock of a gunshot wound to his face spread through his body. This 18 year old 5foot tall rookie was just eight weeks into her first deployment and had never treated anything more serious than an infected mosquito bite. ” I was worried that I would forget my training, but just looking at him lying there, it all fell into place and I knew I could do it.” says Morris. She administered first aid for three minutes with rounds landing all around her before other soldiers helped her drag Page inside the vehicle. Following a medical evac by Lynx helicopter Sgt Page went on to make a full recovery. 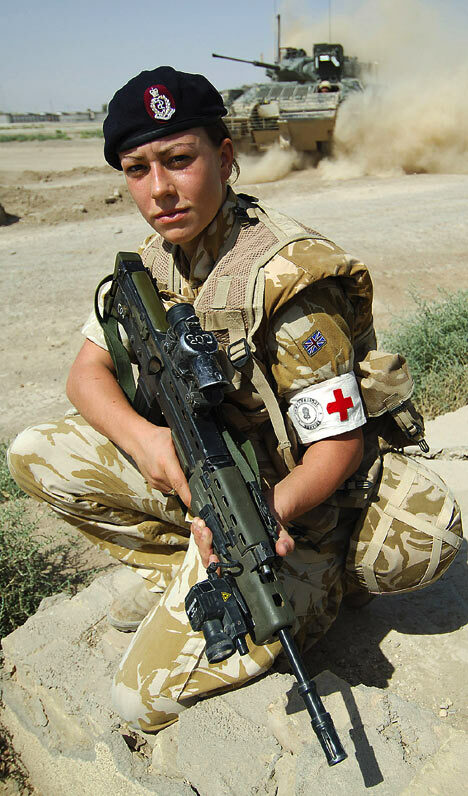 Her commanding officer recommended that she receive a medal for her bravery and she became the first woman ever to receive the Military Cross . The Military Cross is the third highest gallantry medal in the British armed forces equivalent to our Medal of Gallantry. Lance Corporal Morris MC still serves in the British Army today.